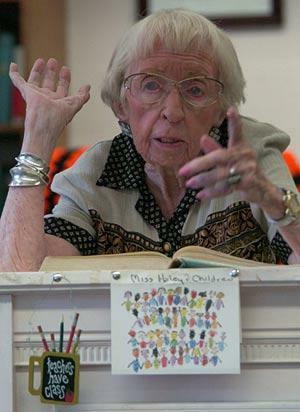 Miss Hazel Haley is retiring after teaching high school English for 69 years. It is estimated that she has taught approximately 13,500 students over the years, 67 of which she has worked at Lakeland Senior High School in Lakeland, Florida. She has conducted class in the same room for the last 54 years. I can’t imagine the things she must have seen over the course of her career. Think of this — she has been teaching long enough to have taught as many of four generations of the same family. Can you imagine having a teacher your great-grandmother had? I think that puts her accomplishment in perspective. In 2001, I was completing my fourth year of teaching. I was burned out. I had a rough year. I had personal problems in my life, but more than that, I just didn’t think I had made the right career choice after all. I really struggled. In the end, I decided to quit teaching and do something else with my life. Something more rewarding. Something people might actually respect me for. I searched fruitlessly and discovered in the process that not many folks were interested in employees with a teaching background. It is difficult sometimes for teachers to change careers. I can’t find the company now, but one temporary staffing agency actually stated baldly on their website that companies don’t like to hire former teachers. The perception is that there’s not much in the way of marketable skills that we can offer. I really wish I could find the website now, but after a half hour of fruitless surfing with only the vague recollection that the letters “B” and “H” were in the agency’s name, I’m afraid I’ve come up with nothing, so you’ll have to take my word for it. The point is, I interviewed for jobs copyediting (it would have been a paycut) and writing insurance textbooks. I interviewed for a position as a dental assistant. I was this close to walking down to the Mellow Mushroom and taking them up on the job offer I saw in the window. No one else was interested, after all. After four months of joblessness, I found a position teaching pre-K that was tolerable until something else came along. Yes, I was back in school. By the end of the school year, I had made up my mind to go back into the secondary classroom. I accepted the first job I was offered, which turned out to be a mistake, but that’s OK. I moved on, and I am extremely happy in my current teaching position. So happy, I can well imagine staying until my retirement if they let me. What I figured out when I had decided to turn my back on teaching forever is that I measure out my life in school years. I like kitschy apple knick-knacks. I like working with teenagers in all their unfuriating teen-ness. I like teaching students how to become better communicators, how to become better readers. I like learning. One of the things I learned when I absented myself from teaching is that all the clichés are true: 2 teach is 2 touch lives 4-ever… A teacher affects eternity; s/he can never tell where his or her influence stops. It’s easy to scoff at these platitudes, but we just don’t know, do we? I can remember the names of most of the teachers I had, starting with kindergarten onward. In their ways, they each had an impact. Mrs. Karr taught me that I wasn’t stupid — I thought I was. She taught me that I could read well. Mrs. Jones taught me there was a time to be serious and on-task. Mrs. Elliott taught me that I had a talent for writing and was an excellent speller. Miss Shearer made such pretty cursive D’s that I copied them and still write them the same way — with the large sloping top loop — to this day. She also taught me to be careful with a compass. Mrs. Esquibel taught me to keep my promises. Mr. Velando taught me to celebrate my talents. Mr. Schmeisser taught me to love books I had to read for school. Mrs. Keener was my role model and mentor. I wanted to be the kind of teacher she was. Being a teacher is special. I imagine Miss Haley will miss it. I know she will reflect upon her years as a teacher and know that she affected the lives of her students in profound and positive ways. One day, I hope that I can look back upon a lifetime of service in education and feel some pride in my accomplishment. I won’t delude myself into thinking I will accomplish anything like Miss Haley has, but that isn’t the most important thing. The most important thing is that I served. To me, that’s what teaching is all about. In the end, I can’t think of anything more rewarding or more worthy of respect. Thanks for the link! And I love the new look! this is a beautiful post. and congrats to miss haley. she will miss teaching. my great-grandmother taught for over forty years, and she missed it until the day she passed away.